I went to Stitches East yesterday and had a fabulous time, but haven’t had the chance to upload pics yet. So, in the meantime, why don’t you join me for some Beribboned knitting? I’ve recently become a moderator for a shiny new group on Ravelry that is intended to be a place where newer designers who are just starting out or who maybe don’t have a group of their own yet can host knit-alongs or crochet-alongs for their published and tested patterns. I think it will be a really fun place to find a variety of projects being worked on that you might not have noticed before. I’m hosting a Beribboned KAL there that runs from now until 12/31/2012. My current pair in progress, using Malabrigo Worsted in Natural. You don’t need to be a member of the group to KAL (although we’d love to have you!) and you can knit either the wristwarmers/mitts (free) or the hat (10% off with coupon code found in the KAL thread) to qualify. At the end of the event I will randomly chose a winner from those who finished their projects to receive a $20 gift certificate to either Cephalopod Yarns or The Verdant Gryphon (winner’s choice! ), the two companies whose yarns I used for the design samples. 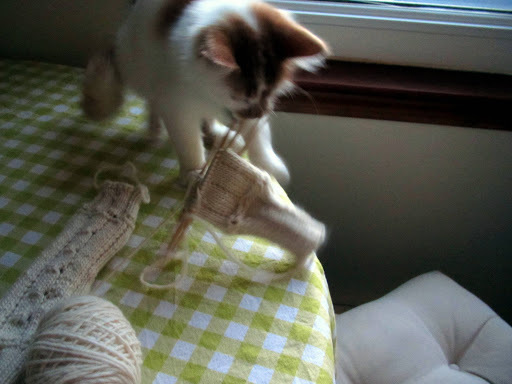 Darwin wants to knit along, too! As I’ve mentioned previously, I think both the mitts and the hat are quick, fun little knits that would make great gifts (the holidays approach!) 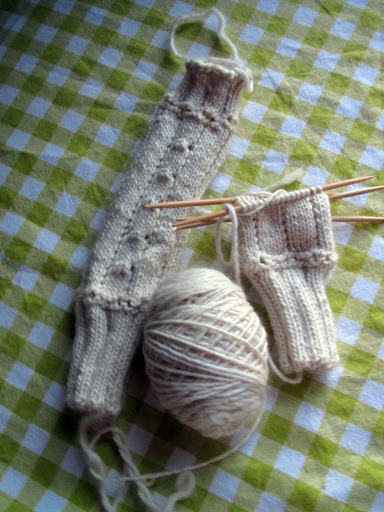 and the patterns are flexible allowing you to use either DK or worsted weight yarn. I’ve recently taken to wearing the hat with the ribbon to the back, like a fun little secret. The wristwarmers are the first things I grab when I’m chilly but want my hands free for typing/knitting because having my wrists covered really warms me up . I hope some of you choose to join in, I’d love to see how your projects turn out! This entry was posted in KAL, kitty, Malabrigo, MyDesigns by shoelaceswitcher. Bookmark the permalink. Man, I should have waiting to finish my berriboned wrists! lol. I am in love with them though, I wear them everywhere. That headband I'm making? I haven't picked it up to work on lately, I really should I guess.. If I had the time I would totally join, but I'll just enjoy seeing other people's pretty knits! You could enter that headband in our KAL if you'd like!